The retina is the light-sensitive tissue that lines the inner surface of the eye. When it becomes detached from the tissue supporting it, a very serious situation exists. It is extremely important to get your pet to the veterinarian immediately if you suspect he is having vision problems. There are several factors that can cause this disorder. The most serious symptom of a retinal detachment is reduced vision or, in some instances, blindness. The severity of your pet’s ability to see is directly related to the seriousness of how detached her retina is, or if it impacts both eyes. Other symptoms include dilated pupils (when the eye shows no response to changes in light), discoloration of the white of the eye, or leaking of the eye and clumsiness due to your pet’s inability to see well. Your veterinarian will perform a complete history and physical examination, including a thorough ophthalmic examination. 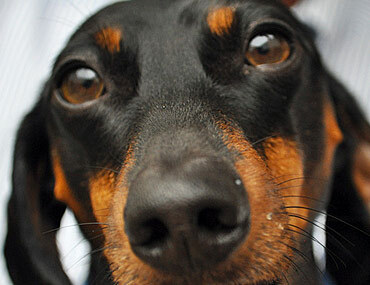 They may also refer you to a veterinary ophthalmologist for additional evaluation. In addition to providing a thorough examination of your pet, your veterinarian may recommend tests to identify the underlying cause. A thyroid test to determine if the thyroid gland is producing too little (in dogs) or too much (in cats) thyroid hormone. It is important to begin treatment as soon as possible to prevent further damage to the eye or permanent blindness. Treatment can include medications and/or surgery. It will depend on the underlying cause of the detachment, the severity of the condition, and your pet’s overall health. While you may not be able to prevent this condition, by being a diligent pet owner and carefully checking your compadre regularly for anything out of place, you will help catch problems in their earliest stages!